Do you remember Take 5 Bars? Do they still make those? Basically, it is a candy bar with nougat, peanuts, caramel, and pretzels…covered in chocolate. It is pretty much salty-sweet deliciousness. 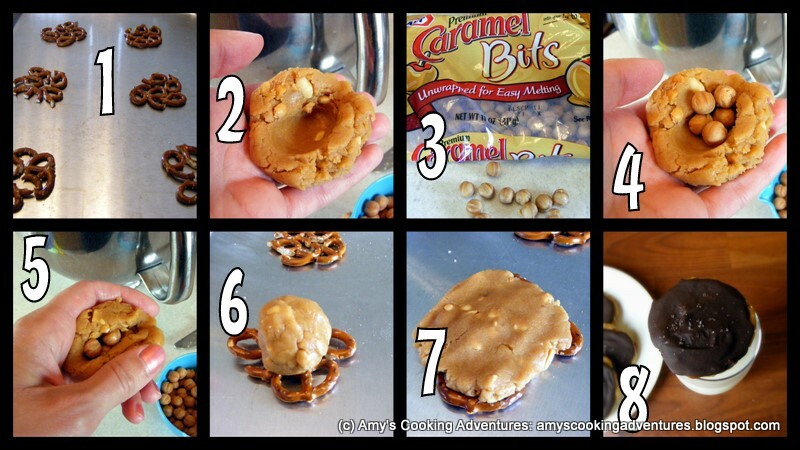 Since I tend to steer away from over priced candy bars, I decided to attempt a cookie version of this yummy treat. The only downside to these is that the caramels are still hard caramels and not at all ooey gooey like a candy bar (perhaps a remake will be in order). However, the taste is all there and I urge you, don’t skimp on the sea salt at the end. It adds that last bit of saltiness that is – mmm!—so good! In a stand mixer, combine with sugar and egg. Add in the peanut butter and the flour. Beat until well combined. On a cookie sheet, arrange groupings of 4 pretzel halves each. Using a 2 tablespoon scoop, scoop out a ball of dough. Use your thumb to make a divot in the dough ball. Place 5-6 caramel bits in the divot. Close the dough around the caramel bits. Flatten the dough into a disc and press onto the pretzels. Bake for 8-10 minutes. Move to wire racks to cool completely. Once the cookies are cool, place the cream into a small saucepan. Place it over medium heat until the cream just begins to bubble. Remove from heat and stir in the chocolate pieces. Stir until completely smooth. Allow the ganache to cool for 5-10 minutes. Spread a liberal amount of ganache onto each cookie and add a generous sprinkle of sea salt.